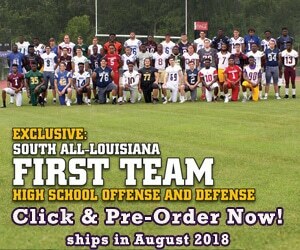 My name is Garland Sylvester, and I am a DE for Central Lafourche High School. LAFM: Max bench, max squat, max clean? My max bench is 295, squat 365, and clean 265. Although we went 4-6, it was a good season. I thought the team played hard and made each game competitive. We were really proud to beat Hahnville who came into the game as a heavy favorite. My best game was against H. L. Bourgeois. I had about 3 sacks and a bunch of tackles. Ray Lewis- I just like how he is an aggressive player and a great leader. I was 6 years old when I started playing in the pee wee league. Our team name was the Cardinals. My dad has had a big influence on me. He has helped me a lot in my football career. I would like to become a physical trainer. I enjoy helping others with physical fitness. I will play FB or OLB in college, and I enjoy playing both. When playing FB, I get to block as well as touch the football. On defense, I enjoy getting to the ball and making plays. Everybody on our team had a great attitude for each game. I can remember being in the weight room and realizing how super motivated our team was every week. We tried our hardest all season. The teachers and administration treat everybody extremely well. They always help when you need it. You can tell they want you to succeed and go to college.